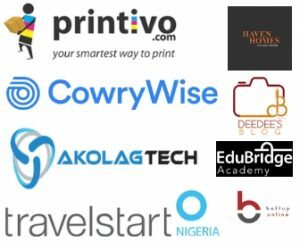 Unlike many who stumbled upon the name Ofada Boy from Twitter, I had my first meeting with this fairly popular brand in April 2018 while roaming around the venue of GTbank food festival. I decided almost immediately I wouldn’t buy ‘nada’ from them going by how fascinating their stand and entire packaging was. So I hoped for a time I’d comfortably afford Ofada Boy. Since I was around Onipanu bus stop around the agreed time for the launch, all I did was jump on the next bus to Ojuelegba and flew a bike to number 1 Mba St, Surulere, Lagos. I was charged N250, an amount a normal me wouldn’t have payed without haggling, but time was running out on me. On getting to the junction, a security guard who must have suspected I’m a first timer took me by the hand after we exchanged pleasantries to the premises and this to an extent gladdened my heart because Ofada boy is tucked quietly in a compound where I can bet no first timer can independently locate. 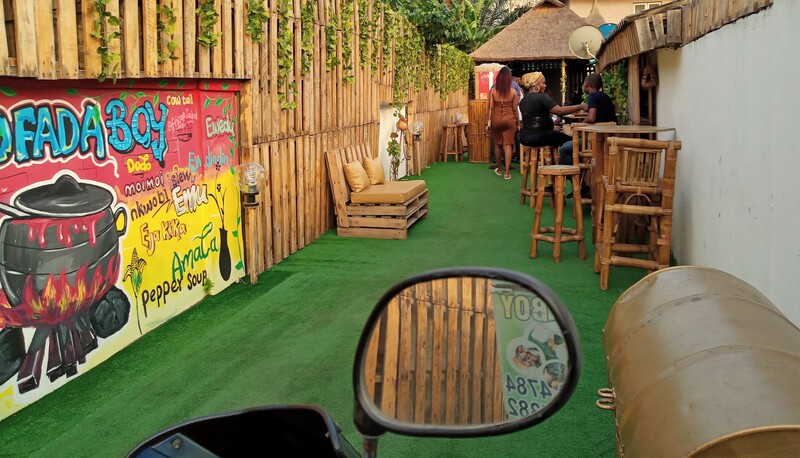 The gates (consisting of two average-sized wooden doors) flung open and for a minute I doubted I was still in Lagos, I took unsteady steps from the gates to the first eating area which hosted the traditional bar for the restaurant. I took a seat directly opposite the bartender before Ebi Tumbo joined me and three others to the space she had earlier reserved within the inner chamber. The traditional Yoruba theme chosen for this space was well orchestrated by folks who actually knew their stuff. I was particularly blown by the meticulous arrangement of every piece of furniture in sight. The artificial grass which stretched from the gates to the bar area was what my eyes focused on before being distracted by the stylishly built seats (made out of special wooden skeletons and leather covering ) within the lounge and bar area. The wall covering and the sane ventilation did their bits in making me feel at home within the bar area which can comfortably accommodate 25 people. On settling at our table, I gave a satisfactory nod as I saw quite a number of people feasting on their foods. The few who weren’t eating played traditional board games while waiting on their orders to arrive. 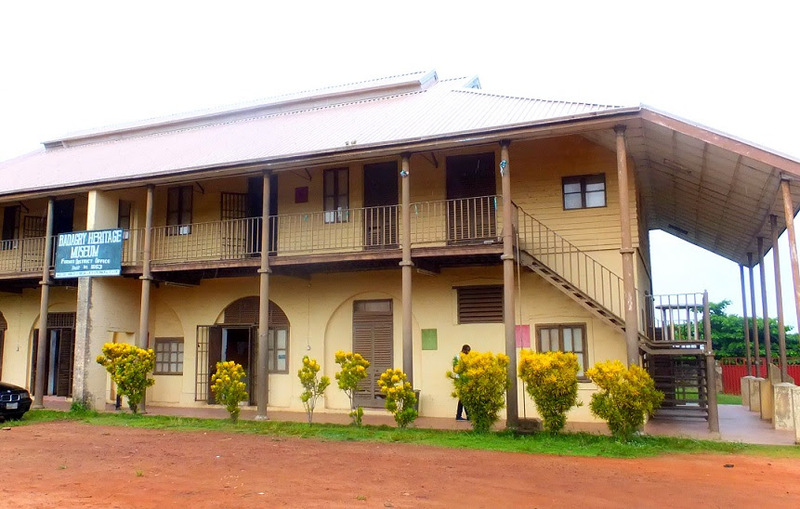 The window blinds, doors and wall coverings were made of canes, Raffia and mats respectively. I don’t know how many horse power the AC was, but it connived superbly with the OX standing fan to give everyone enough chill to last them for a lifetime. The soothing voice of Chief Commander Ebenezer Obey made me forget the promise I made to Jon Bellion that I wouldn’t mime any other song throughout December. The interior has 3 divisions which can conveniently sit 40 people. When (on my arrival) a young man came to me with a large smile (which I could tell wasn’t faked) to ask me what he could do for me. “Yes!” I exclaimed in my head. 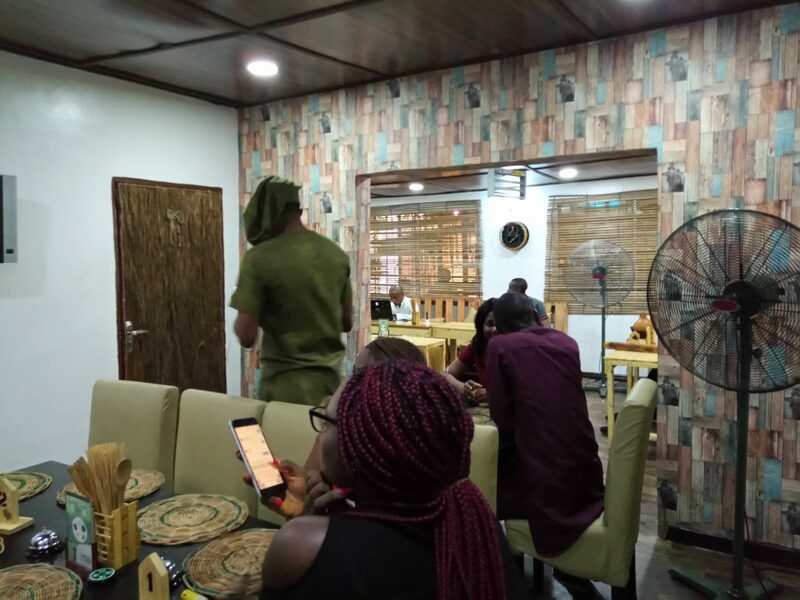 “Finally, a Nigerian restaurant is getting it right with customers Service”. But my joy didn’t live long, and this isn’t due to the attitude of the attendants but for their lack of professionalism. I mean, what better way can I explain attendants who can’t ensure the tables and eating areas are thoroughly clean before welcoming new customers. If that is overlooked should a forgetful attendant be spared as well? This traits made the attendants synonymous to a respectful bride without exposure. Long after we were done eating, this was how our table looked. 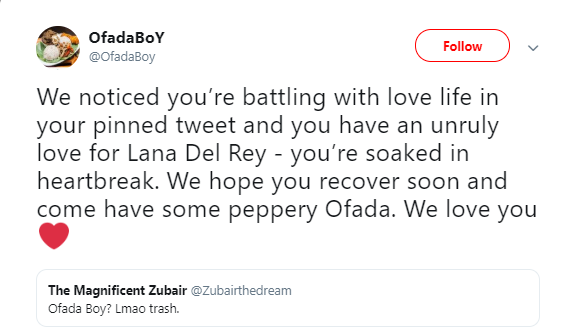 Here’s what Ofada Boy told a customer on twitter… you see, there’s a very tiny line between savagery and utmost insensitivity. Here’s a golden opportunity to win back a customer who’d potentially become a promoter, but no, the likes and retweets were more important. Another low for me was the delay in serving our food, considering the fact that we ordered a plate of their most popular delicacy (Ofada+Plantain+sauce) which I thought they could have mastered the act of making . When Ebi complained about the delay, I tried pacifying her by saying the delay could be as a result of them taking their time to quickly prepare our food. She countered by saying a time frame should have been attached to each order so customers can know for how long more they’d be waiting. The food finally arrived and to my disappointment, it was as cold as a dog’s nose. 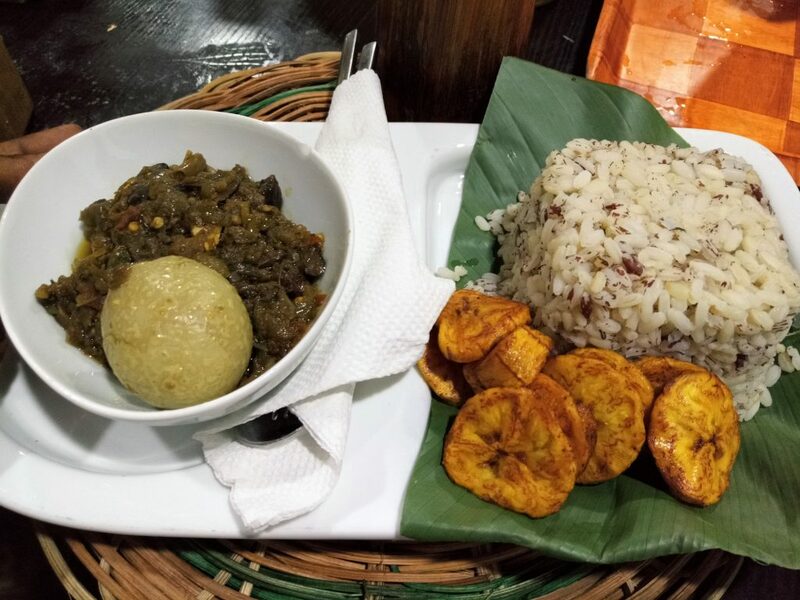 The truth must be told, for a restaurant wearing the hat of a delicacy as important as Ofada, there wasn’t really anything out of the ordinary about the food which I find absurd because their specialization should have helped uncover more creative things to do with Ofada. But hey, this didn’t take a way the fact that the sauce was really good, even though it wasn’t peppery. I particularly loved the fact that the boiled eggs were partially bruised- making room for the sauce to easily penetrate the yolk. I’m not too good with numbers but I was sure I saw as much as 10 meats in my portion. We opted for the Ofada classic which costs N1,350. It contained Ofada rice (served on leaf), assorted meat, beef, ponmo egg and plantain. Ofada Rice, Meat (Assorted), Beef (Eran), Ponmo, Egg (Optional), Plantain, Yo-yo fish and prawns. After the ambiance, the palm wine was to me the highlight of the day. It tasted really good and fresh. 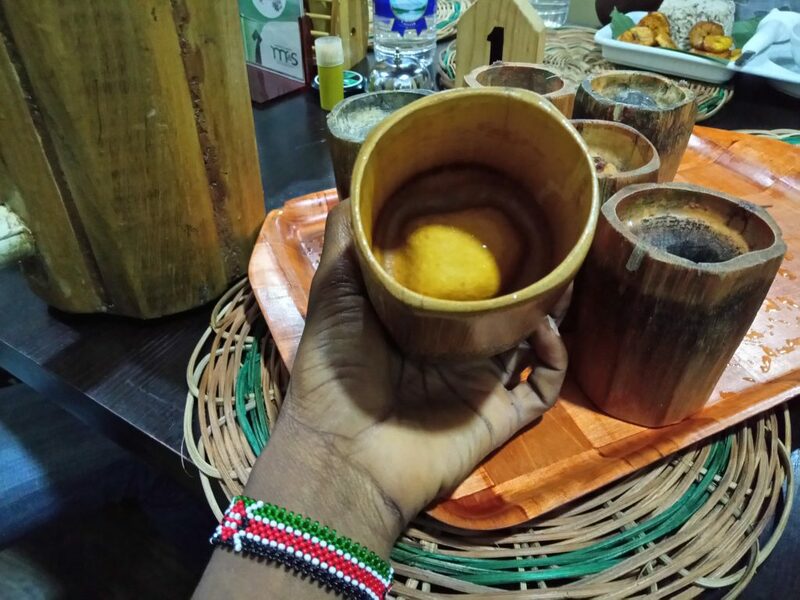 The bamboo cups and wooden dispenser probably played key roles in ensuring this superb delivery. The availability of board games for customers actually fascinated me as I saw people playing Ludo and Ayo . The utensils (which included local calabashes, table brooms and wooden spatulas) also made me want to stay longer for no other reason than just stare at them. They all brought back loads of lost childhood memories. 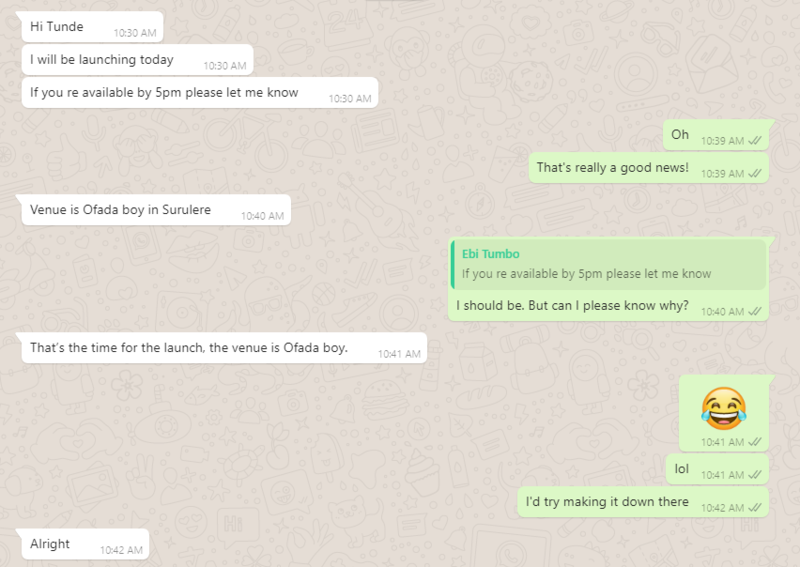 I was glad Ofada boy offers outdoor services and home deliveries and also have the option of cash or POS payment. Will I go again? Of course! 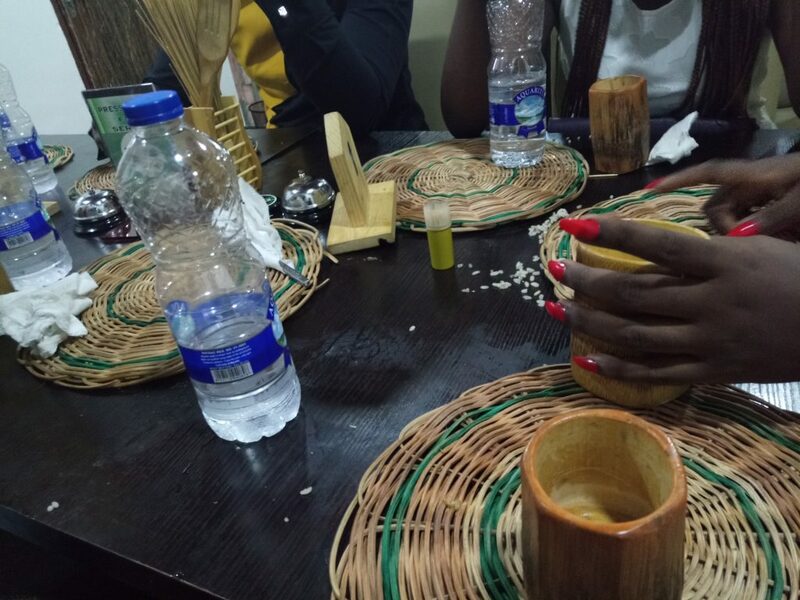 But it has to be a time when I need some palm wine in my system with a couple of friends. 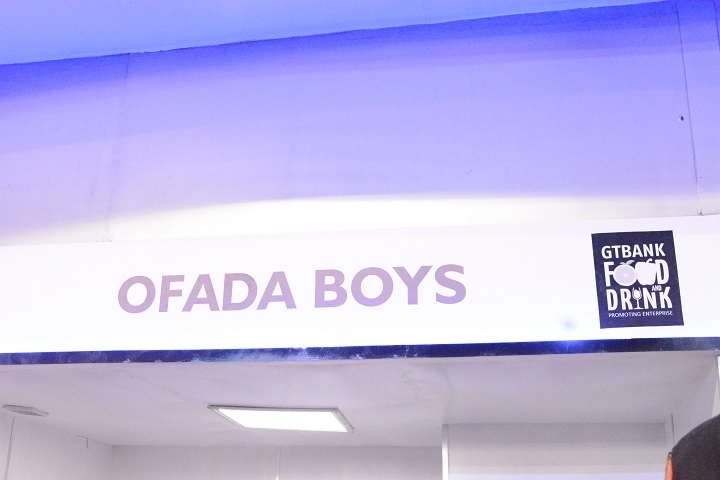 Have you ever been to Ofada Boy’s place? Kindly let me know what your experience was like in the comment section. I really want to read your view. Previous articleTraveling From Lagos To Benin Republic By Road? I’m glad you found it helpful Victoria. Please let me know about your experience whenever you eventually visit. First time reader and I must say, Nice writeup. Lovely read as usual. I am looking forward to visiting soon. We could do it together! This is nice, thumbs up Tunde.